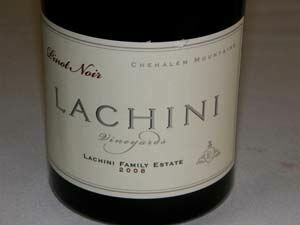 A boutique family-run winery focused on Pinot Noir. 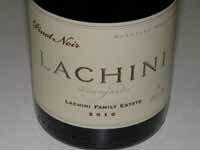 Lachini Vineyards began producing single vineyard Pinot Noir from the 45-acre estate vineyard in 2001. The estate vineyard has three distinct blocks by varying soil depths and clones (East-Pommard, Upper & Lower Middle-Dijon, and West - 828, 667, Wädenswil). The winemaker is renowned talent Laurent Montalieu and the viticulturist is Ezequiel Arcos. Production is about 4,000 cases annually of estate grown Pinot Noir (Cuvee Giselle, Family Estate and 'S'), vineyard-designated Pinot Noirs (Keller Vineyard and Windy Hill Vineyard in Sonoma Coast, Ana Vineyard in Dundee Hills), Pinot Gris, Chardonnay and Washington state Cabernet Sauvignon.